It’s mid/late summer, which can mean only one thing – It’s watermelon carving time! Watermelons are plentiful and usually inexpensive this time of year, so you’ve got plenty of material to work with. Will you carve some kind of fruit basket? An animal? A funny character? Something ornate and artistic? The sky’s the limit! If you’re ready to carve right away, or if you’ve already carved something contest-worthy, you’re in luck: The Watermelon Board’s annual watermelon carving contest is going on right now and you can enter from now through 11:59 p.m. EST on August 3. The categories are Most Elegant Carving, Best Fruit Basket Carving, Best Animal Carving, Funniest Carving, and Star-Spangled Carving. Just don’t forget that you need a picture of your watermelon carving PLUS a picture of you with your carving (to prove that you’re the one who carved it). Spoiler alert: We’re entering our BayMelon (WaterMax?) carving from Big Hero 6. This lovable guy is pretty easy to create – it’s just a little time-consuming because you have to patiently carve off the whole green layer. To make this carving, we used one big and one small watermelon and carved off the green layers of both. Then we carved a bowl-shaped indentation in top of the large watermelon so that the small one could rest there comfortably (give credit to our youngest kid for this idea.) 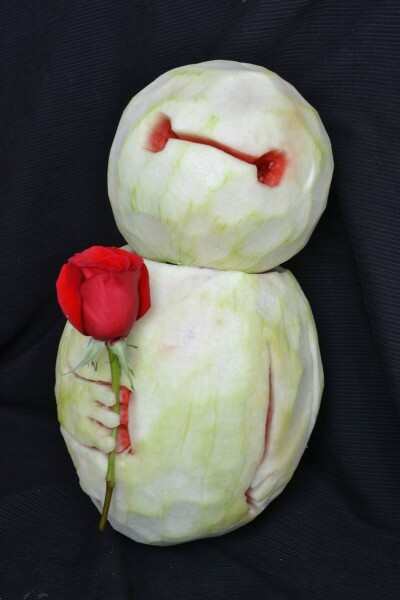 To get the rose in his hand, we first cut out the outline of fingers. Then we made a small cut separating the white layer from the red layer so that we could slide the rose under his white “fingers” and he could grip it. Looking for more watermelon carving inspiration? 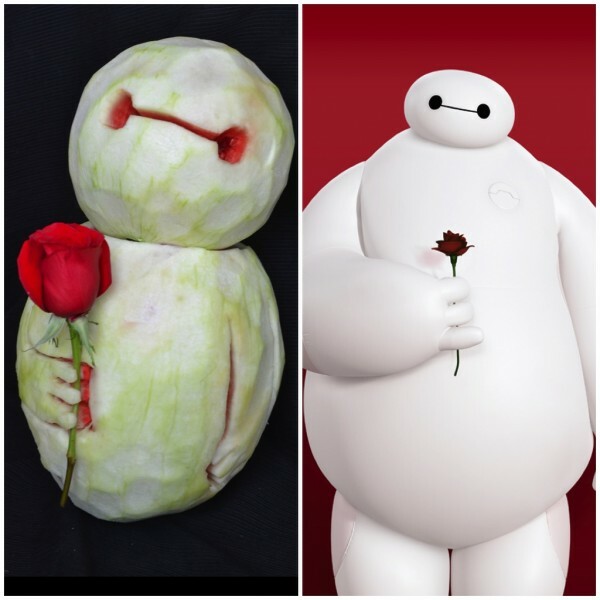 Check out our watermelon carving Pinterest board for some great carvings! Can’t wait to vote for yours! It looks great! !